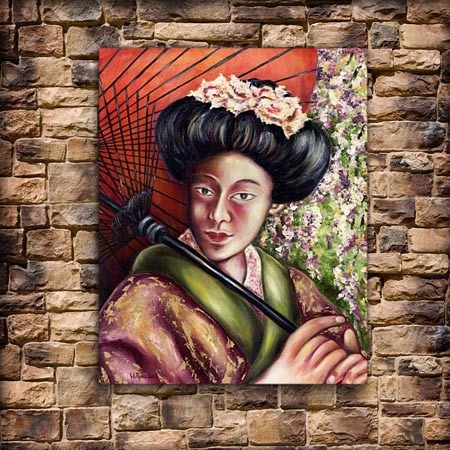 Artist Original Oil Paintings for Sale Online : Japanesque : Painting Details - "Nadeshiko"
'Yamato nadeshiko' is the name of a flower known as a 'fringed pink' in English. Also known as a `nadeshiko' it is a small, common, but easily distinguishable flower which grows wild. `Yamato' is one of the many names of Japan. Yamatonadeshiko can also signify a kind of an ideal Japanese woman who revolves around acting for the benefit of the family and following instructions or acting in the best interest of patriarchal authority figures. Virtues include loyalty, domestic ability, wisdom, and humility. Today, in most cases, the term "Yamato nadeshiko" is used in the context of nostalgia, referring to Japanese women with "good old" traits. 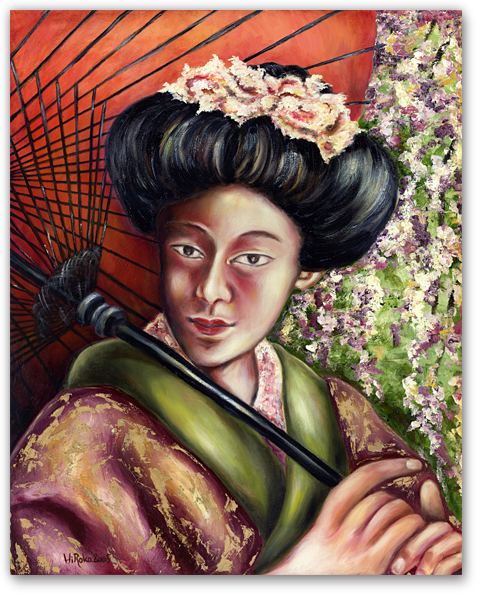 Purchase Original Oil Painting "Nadeshiko"